Triathlete Bo Parrish received the Great Comebacks South Region Award in September 2012 during a ceremony at the Southeast Region Wound Ostomy and Continence Nurses (WOCN) Society. He received the award from Rolf Benirschke the founder and chairman of the Great Comebacks Program. Bo struggled with Crohn's disease for over a decade and finally got an ileostomy. During his long recovery in the hospital he was visited by a triathlete friend and he then started planning his recovery to enter the sport as soon as possible. He completed his first tri event less than 5 months after surgery. Bo now has completed over 100 tri events and is a member of the Timex Multisport Team. Congratulations Bo!! Great Comebacks® is sponsored by ConvaTec, a world-leading developer and marketer of innovative medical technologies for community and hospital care, in partnership with the Crohn’s & Colitis Foundation (CCFA), the United Ostomy Associations of America, Inc. (UOAA), the Intestinal Disease Education and Awareness Society (IDEAS), the Wound, Ostomy and Continence Nurses (WOCN®) Society™ and the American Society of Colon and Rectal Surgeons (ASCRS). The Parthenon Company is a proud supporter of ostomates everywhere and we congratulate Mr. Parrish. 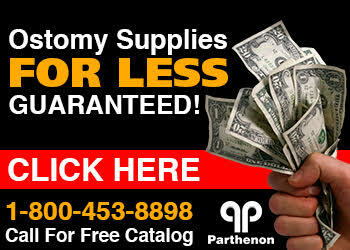 Parthenon is a manufacturer and distributor of ostomy supplies nationwide.